When looking through all the different options for industrial label printers, you’ll want to make sure you choose one that will meet all of your facilities needs. One important thing to consider is what size labels you need to print. In many cases, it can be important to be able to create oversized labels to help improve hazard communications, and general labeling throughout the facility. When this is the case, the LabelTac 9 label maker is one of the best options on the market today. This large label maker allows you to create high quality labels that can be up to 9’’ wide. It can print up to 4’’ per second, so you can create extremely large labels without any type of delay. Why do you need a Large Label Maker? Large label makers are a great choice because they can be used for so many different things throughout the facility. The following are some of the most common reasons why these types of label printers are used, but you’ll also find other specific benefits for your own facility. 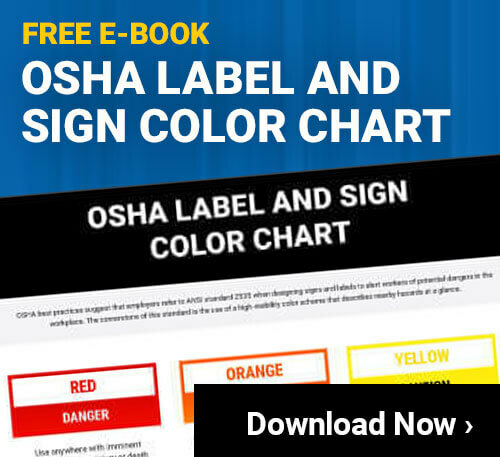 OSHA Labeling – There are many things that need to be labeled within a facility in order to meet OSHA regulations. Being able to print them off immediately within the facility will help ensure you are always compliant with all regulations. Drum Labels – Large drums are frequently used for storing chemicals and other substances within a facility. Creating a large label that will be placed on these drums will help ensure everyone can easily see what is within them. Safety Signs – Since these labels can be so large, you can print them off to be used as signs throughout your facility. It can be anything from a sign letting people know where safety equipment is stored, to any type of safety warning signage that is needed. Extra Large Signs – It is also possible to print off edge to edge labels, so you can combine them to form virtually any sized sign that you need. Marketing Labels – Many companies will use these types of labels to create internal marketing tools. Putting up signs with company logos on them, or adding a label to facility property identifying the owner of each item is a great way to build company loyalty. There is, of course, no real limit as to what you can use these types of labels for. Go through your facility and look for different areas within your facility where everyone can benefit from improved communication. Of course, even large label makers can still print off the smaller labels as well. Depending on the specific needs of your facility, it is easy to load up smaller label stock, so you can print off the custom labels you need. This is important for being able to label tools, smaller containers, and many other things as well. In fact, for many facilities it is more common to print off smaller labels than it is to use the larger label options. It is good, however, to have the ability to print off the larger labels when you have the need. Whenever picking out equipment for any type of manufacturing facility, you will want to make sure to choose an option that will be able to stand up to the rough environment. All LabelTac printers are made using high quality, durable materials so it will work well in nearly any environment. Whether you place this printer in a safe office where people can use it, or it is right out on the floor, the sturdy die-cast chassis construction will hold up well. Of course, it is always best to operate any type of technical equipment, including label printers, in as safe of an environment as possible. It is good to know, however, that should something happen, this printer is extremely durable. Media Viewing Window – This printer allows you to see the labels as they are being printed so you can make sure they are right. Cutter Module – You can have the printer cut the labels to the precise size you want them. This helps you to create custom labels that meet the very specific needs you have. LCD Display – The large LCD display on this machine lets you see the different settings are available, and also what activity is taking place on the printer. Six Menu Buttons – Controlling the LabelTac 9 label printer is extremely simple with the six menu buttons. 300 dpi Quality – Each label will be easy to read and understand, since the printer offers 300 dpi resolution. This allows for smooth edges, easy to read text and high quality images. Fast Printing – This printer can print up to 102 mm, or 4’’, per second. This is quite a fast option so you can have the labels you need right away. One of the biggest advantages to having a label printer on site is that you are able to create and print custom labels that meet your very specific needs. While you will often need to print out standard labels to meet certain regulations, the custom label design is also very useful. You can use photo shop or just about any other program to create your own custom designed labels for your facility. Whether you’re just looking for text based labels, or you want to print off detailed pictograms to convey a message, this printer can handle it all. Since you are designing and printing these types of labels in your own facility, the total costs will be far less than if you were to order them from a third party print shop. In fact, all the labels you print will be cheaper when you are using your own dedicated label printer. One of the most important benefits facilities will gain from having this type of large label maker on site is that they can quickly create safety labels and signs. This is a great way to improve the overall hazard communication within your facility, which is an essential component to all safety programs. In fact, according to recent OSHA reports, problems with hazard communications are one of the most often cited violations they issue. If these labels can prevent even just one safety violation, it will be well worth the investment. If you are considering purchasing a large label maker, make sure you take the time to really determine which printer you want to get, and what it will be used for. You want to make sure you get the best possible results for your investments, and you want to be sure that the printer will be able to meet all your facilities needs. Once you’ve decided what printer you would like to purchase, order it and have it set up right away. Also, take the time to train key individuals on how to design and print labels on the new machine. This will help ensure it is being used as much as possible, which will be how it can be as beneficial to the facility as it should be.